The rolling landscapes of Tuscany’s Val d’Orcia were designed to look like a painting. It’s part of the reason that so many artists came to this part of Italy to capture the scene. Amongst the fields and the pockets of woods are small fortified towns up the crests of hills. They add to the romantic vistas today as much as they did centuries ago during the Renaissance when conscious efforts were being made to reshape the layout of the area. But amongst all the towns, there is one that stands out. Pienza. I have already written about the landscapes of the area, which have been listed as a World Heritage Site, and I would recommend you read my story about the Val d’Orcia of Tuscany. But today I want to focus on Pienza because it has also been included on the World Heritage List, separately and earlier, because of its significance. Walking across the valley, I see Pienza in front of me for at least half an hour before I arrive. Step by step along the dirt roads between farms, I get slightly closer and the individual buildings become clearer. On the last hill that I need to climb, a tractor is doing slow laps of a green field that stands between me and the town. Pienza is both a town and a city. In terms of its size and official standing from a bureaucratic sense, it is a town with a population of only about 2000 residents. But historically it is designated as a city and is still regarded that way by many because of the status it has in the region. This is what makes the place so fascinating. The approach to Pienza is like that of most hillside towns in the Val d’Orcia. Even walking through the main western gate is not too out of the ordinary, although I notice that the artwork above the entrance is more opulent than usual. It’s when you get to the centre of the town that you realise this is no ordinary place. There’s a cathedral, palaces, and other opulent buildings. Not what you expect for a population of 2000 people. But there’s a reason. Pienza was the birthplace of Pope Pius II who was in power for just six years between 1458 and 1464. It wasn’t a lengthy reign but it was long enough to order that an ‘ideal city’ be built within reach of Rome. Being a Renaissance humanist, he wanted this new city to demonstrate those ideals. Now, of course, you’ve probably already guessed this… but Pienza was the site that Pope Pius II chose for his new ideal city and work began immediately to construct the most impressive of the buildings around a central square. The ones that I find myself standing in front of in awe. Most obvious is the the cathedral. The facade is one of the earliest examples of Renaissance church design and inside the building is a wonderful collection of art. 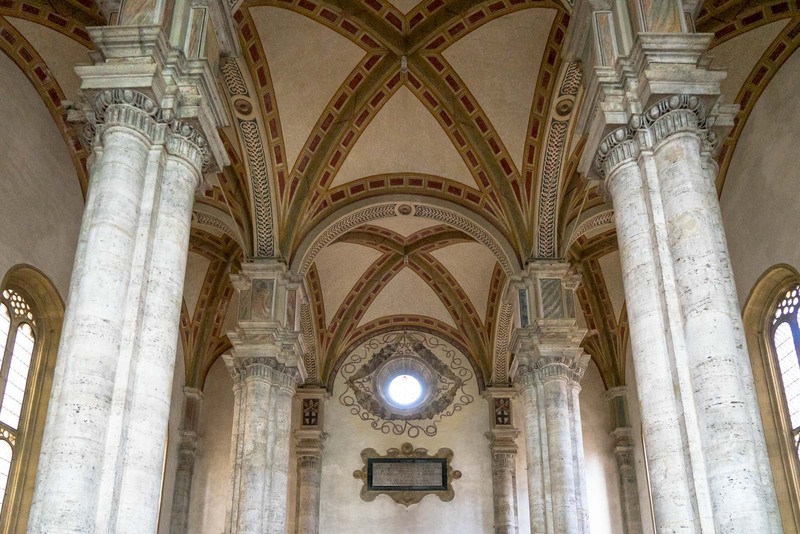 My eye starts at the painted ceilings, comes down to the tall stone columns and rests on the altar. The large windows behind it at the end are without colourful stained-glass. That end of the building is the edge of town with only the valley below so the sun streams in. Next to the cathedral is the most important of Pienza’s palaces, the Palazzo Piccolomini. It was a summer home for the pope and was one of the first buildings to be constructed in the Renaissance design. Built from stone and marble, it was conceived to provide protection from the heat in summer and the cold in winter. Every part of the palace has a practical function but it is also aesthetically pleasing. On the opposite side of the square is another palace, built by a cardinal called Rodrigo Borgia. To help fill out the new city, the pope encouraged his cardinals to build their own palaces here to be used as summer homes. Whether this is related or not, Borgia would go on to become pope himself (named Alexander VI). The palace is now used as the Diocesan Museum with a small collection of artworks. On the fourth side of the square is the town hall (also called the Palazzo Comunale). From the outside, the most noticeable feature is the brick bell tower. You’ll notice that it’s shorter than the bell tower on the cathedral, which is an intentional symbol that the Church is more important. All in all, about 40 buildings within Pienza were constructed or reconstructed to realise the dream of Pope Pius II. Wandering through the streets that flow out from the central square and the main road that connects the east and west gates, it’s hard to tell these days which those are. Everything seems to flow together into a wonderful medieval urbanity. Of course, the modern is present as well but never in a way that’s too intrusive. Although there are quite a few tacky souvenir shops, I also notice plenty of delightful small restaurants, cafes, and local produce shops. 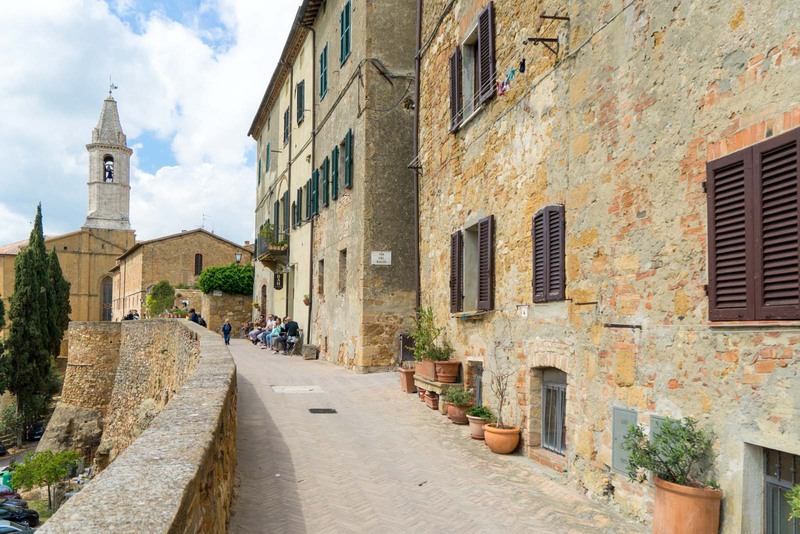 Visiting Pienza is not simply about the architecture and history, it’s also a small window into the Val d’Orcia and the wine and food that comes from this region. Before the pope’s intervention, the town was called Corsignano. 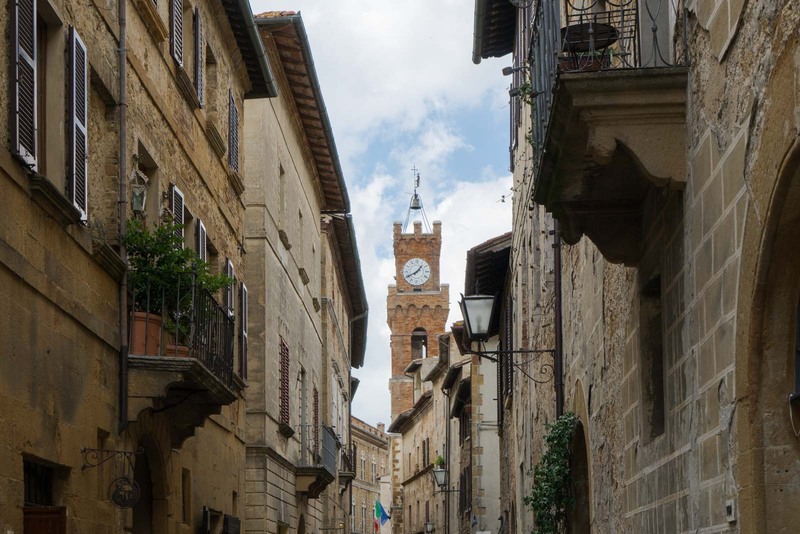 It was renamed Pienza in honour of the man who really put it on the map – the name means ‘City of Pius’. And today we have a lot to thank him for. He gave us this wonderful town and influenced the entire landscape of the valley we see around us. Not only that, as a leading Renaissance humanist, he also had an effect on much of the architecture and art styles we see in northern Italy today. It’s no wonder that so many people believe this town is really a city. You can see all the hotels available in Pienza here. However, if you’ve read my story about the Val d’Orcia, you’ll know that I recommend exploring the area from Chiusi. So I’ll recommend some accommodation there. If only history books were written like blogs, I made have actually read them! Lol.